Morehead's Musings: Who Will Underwrite the Missional Revolution? 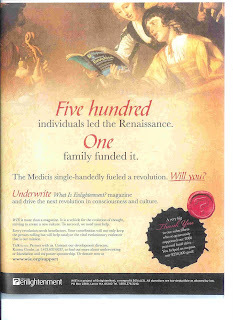 The Medicis single-handedly fueled a revolution. Will you? Missional leaders to missions in the West are few, and there are even fewer engaged in missions to new religions. This work has the potential to drive the next revolution in culture. Who will underwrite the missions revolution? This is a topic close to my heart--and empty wallet! I wish I knew the answer to your question--and had their business card. The question of finances for mission is critical. I'm coming across more people with a passion for missional ministry, yet who don't have a clue how to pay the bills and be involved. John, I'm with you on this issue. Just today I received a letter from one of my major supporting churches indicating that they would no longer be part of my financial support after June because of a change of support goals and desires. I appreciate this, but I am under-funded to begin with, and these kinds of things hamper effective ministry. What many Christians don't realize is that it takes time to work through the relevant literature related to missions, engage in reflection, and then devise appropriate strategies and applications. Who will underwrite this? Who has the vision for the future in this regard in North America? This is a major issue that needs to be addressed in mission strategy circles.